OM! HAVING BOWED down to Narayana, and Nara, the most exalted of malebeings, and also to the goddess Saraswati, must the word ‘Jaya’ beuttered. Sanjaya said, “Then Bhishma, the son of Santanu, went out with thetroops. And he disposed his own troops in mighty array calledSarvatobhadra. Sanjaya said, “Then the noble Abhimanyu of great energy, borne by hissteeds of a tawny hue, rushed at the mighty host of Duryodhana,scattering his arrowy showers like the clouds pouring torrents of rain. Dhritarashtra said, “How, O Sanjaya, did Alamvusha resist in combat theheroic son of Arjuna smiting many of our mighty car-warriors in battle? Dhritarashtra said, “How did those bulls among men, viz., that greatbowman Drona, and Dhananjaya the son of Pandu, encounter each other inbattle? Sanjaya said, “At mid-day, O king, happened a fierce battle, fraught withgreat carnage, between Bhishma and the Somakas. Sanjaya said, “O tiger among men, Arjuna sent those Kshatriyas thatfollowed Susarman to the abode of the King of the Dead by means of hiswhetted shafts. “Sanjaya said, ‘Beholding Bhishma excited with wrath in battle,surrounded on all sides by the Pandavas like the Sun in the firmament. Sanjaya said, “Then thy sire, excited with wrath, began to strike theParthas and their troops all round, with excellent shafts of greatsharpness. And he pierced Bhima with twelve shafts, and Satyaki withnine. “Dhritarashtra said,–‘Thou hast, O Sanjaya, duly described Jamvukhandato me. Tell me now its dimensions and extent truly. Dhritarashtra said, “How did Sikhandin the prince of the Panchalas,excited with wrath, rushed in battle against the grandsire, viz., Ganga’sson of righteous soul and regulated vows. Sanjaya said, “Arjuna then, O king, beholding the prowess of Bhishma inbattle, addressed Sikhandin saying, ‘Proceed towards the grandsire. Sanjaya said, “The mighty bowman (Alamvusha) the son of Rishyasringa, inthat battle, resisted Satyaki clad in mail and proceeding towardsBhishma. Sanjaya said, “Arjuna covered with his straight shafts the mightycar-warrior Salya who was struggling vigorously in battle. Sanjaya said, “Abhimanyu, O king, displaying his prowess for the sake ofBhishma, fought with thy son who was supported by a large force. Sanjaya said, “When the combatants of both armies, strong in number, werethus disposed in battle array, all those unretreating heroes, O Bharata,set their heart upon the region of Brahma. “Sanjaya said, ‘O Kauravya, that which is heard about the islands in thenorth, I will recount to thee, O Great king. Listen to me now. (Thitherin the north) is the ocean whose waters are clarified butter. Sanjaya said, “Thus all the Pandavas, placing Sikhandin before thempierced Bhishma in that battle repeatedly surrounding him on all sides. Dhritarashtra said, ‘Alas, what was the state of (my) warriors, OSanjaya, when they were deprived of the mighty and god-like Bhishma whohad become a Brahmacharin for the sake of his reverend sire? “Sanjaya said,–‘After the night had passed away, O monarch, all thekings, the Pandavas and the Dhartarashtras, repaired to the grandsire,Those Kshatriyas then saluted that bull of their order, that foremost oneamong the Kurus, that hero lying on a hero’s bed, and stood in hispresence. “Sanjaya said,–‘After Santanu’s son Bhishma, O monarch, had becomesilent, all those rulers of earth, there present, then returned to theirrespective quarters. “Dhritarashtra said,–‘How hath Bhishma, that bull among the Kurus, beenslain by Sikhandin? How did my father, who resembled Vasava himself, falldown from his car? Sanjaya said,–“Deserving as thou art, this question is, indeed, worthyof thee, O great king. It behoveth thee not, however, to impute thisfault to Duryodhana. Sanjaya said,–“When the night had passed away, loud became the noisemade by the kings, all exclaiming, Array! Array! Sanjaya said,–“Just as the holy Krishna-Dwaipayana Vyasa had said, inthat very manner the kings of the Earth, mustered together, came to theencounter. Sanjaya said,–“Soon after, O king, a loud uproar, causing the heart totremble was heard, made by the combatants ready for the fight. Dhritarashtra said,–“Beholding our ten and one Akshauhinis arrayed inorder of battle, how did Yudhishthira, the son of Pandu, make hiscounter-array with his forces smaller in number? Dhritarashtra said,–“When the Sun rose, O Sanjaya, of my army led byBhishma and the Pandava army led by Bhima, which first cheerfullyapproached the other, desirous of fight? Sanjaya said,–“Beholding the vast Dhartarashtra army ready for battle,king Yudhisthira, the son of Kunti, gave way to grief. Dhritarashtra said,–“There (on the field of battle) O Sanjaya, thewarriors of which side first advanced to battle cheerfully? “The Holy One said,–‘This imperishable (system of) devotion I declaredto Vivaswat: Vivaswat declared it to Manu; and Manu communicated it toIkshaku. “Arjuna said,–‘Thou applaudest, O Krishna, the abandonment of actions,and again the application (to them). Tell me definitely which one ofthese two is superior. “Vyasa said,–‘Asses are taking births in kine. Some are having sexualpleasure with mothers. The trees in the forests are exhibitingunseasonable flowers and fruits. “The Holy One said,–‘Regardless of fruit of action, he that performs theactions which should be performed, is a renouncer and devotee, and notone who discards the (sacrificial) fire, nor one that abstains fromaction. “The Holy One said, ‘Listen, O son of Pritha, how, without doubt, thoumayst know me fully, fixing thy mind on me, practising devotion, andtaking refuge in me. “The Holy One said, ‘Now I will tell thee that art without envy that mostmysterious knowledge along with experience, knowing which thou wilt befreed from evil. “The Holy One said, ‘Once more still, O mighty-armed one, listen to mysupernal words which, from desire of (thy) good, I say unto thee thatwouldst be pleased (therewith). “Arjuna said,–‘This discourse about the supreme mystery, calledAdhyatman, which thou hast uttered for my welfare, hath dispelled mydelusion. “The Holy One said, ‘This body, O son of Kunti, is called Kshetra. Himwho knoweth it, the learned call Kshetrajna. Know me, O Bharata, tobe Kshetras. “The Holy One said, ‘I will again declare (to thee) that supernal scienceof sciences, that excellent science, knowing which all the munis haveattained to the highest perfection from (the fetters of) this body. “The Holy One said, ‘They say that the Aswattha, having its roots aboveand branches below, is eternal, its leaves are the Chhandas. He whoknoweth it, knoweth the Vedas. Vaisampayana said,–“Having said these words unto Dhritarashtra, Vyasatook his departure. And Dhritarashtra also, having heard those words,began to reflect in silence. Sanjaya said,–“Beholding Dhananjaya then to take up once again (his)arrows and Gandiva, the mighty car-warriors (of the Pandava party)uttered a tremendous shout. Sanjaya said, “On the forenoon of that awful day, O king, the terriblebattle that mangled the bodies of (so many) kings commenced. Sanjaya said,–“O king, I will now describe to thee the combats ofhundreds and thousands of foot-soldiers. O Bharata, in utterforgetfulness of all consideration due to others. Dhritarashtra said, “When the generalissimo Sweta, O son, was slain inbattle by the enemy, what did those mighty bowmen, the Panchalas with thePandavas, do? Sanjaya said, “When the troops, O bull of Bharata’s race, were withdrawnon the first day, and when Duryodhana was filled with delight upon(beholding) Bhishma excited with wrath in battle, king Yudhisthira thejust, speedily repaired unto Janardana, accompanied by all his brothersand all the kings (on his side). Dhritarashtra said, “Tell me, O Sanjaya, how that great bowman Drona andthe Panchala prince of Prishata’s race encounter each other in battle,each striving his best. Sanjaya said,–“When the night having passed away, the dawn came,Santanu’s son Bhishma, that chastiser of foes, gave the order for the(Kuru) army to prepare for battle. Sanjaya said, “Then those kings, excited with rage, beholding Phalguni inbattle, surrounded him on all sides with many thousands of cars. “Dhritarashtra said.—“Thou art intelligent, O Sanjaya, and acquaintedwith the truth (about everything). Thou hast duly given a description ofthe island in brief. Sanjaya said,–“When the night passed away, O Bharata, the high-souledBhishma, with wrath engendered, supported by a large force, and stationedat the head of the Bharata army, proceeded against the foe. Sanjaya said, “And Drona’s son, and Bhurisravas, and Chitrasena, O sire,and the son of Samyamani also, all fought with Subhadra’s son. 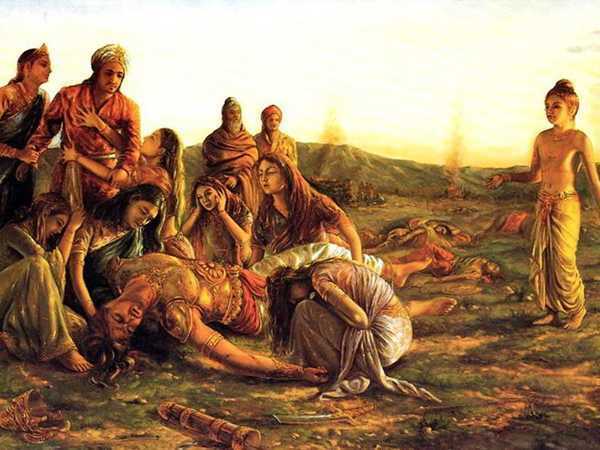 Dhritarashtra said,–“I regard destiny to be superior to exertion, OSanjaya, inasmuch as the army of my son is continually slaughtered by thearmy of the Pandavas. Sanjaya said, “Then, O king, Bhurisravas, excited with great wrath,pierced Satyaki with nine arrows like the conductor of an elephantpiercing an elephant with the iron hook. Dhritarashtra said, ‘Hearing of those feats of the sons of Pandu whichare incapable of being achieved by the gods themselves, my heart, OSanjaya, is filled with fear and wonder. “Bhishma said, ‘Hear from me, O king, this hymn that was uttered byBrahman himself. Sanjaya said, “After the night had passed away and the sun had risen, thetwo armies, O king, approached each other for battle. Beholding eachother, each rushed in united ranks towards the other excited with rageand desirous of vanquishing the other. “Dhritarashtra said,–‘Tell me, O Sanjaya, thou of great intelligence, ofthe regions to the north and the east side of Meru, as also of themountains of Malyavat, in detail. Sanjaya said, “Then Bhishma the son of Santanu fought fiercely,desirous of protecting the sons from the fear of Bhimasena. Sanjaya said, “Beholding his brothers and the other kings engaged inbattle with Bhishma, Dhananjaya, with weapons upraised, rushed againstthe son of Ganga. Sanjaya said, “Sikhandin with Virata king of the Matsyas speedilyapproached Bhishma that invincible and mighty bowman. Sanjaya said, “King Virata then pierced that mighty car-warrior, viz.,Bhishma, with three shafts. And that great car-warrior pierced his(antagonist’s) steeds also with three shafts furnished with golden wings. Sanjaya said, “Then, O king, the mighty-armed Satyaki invincible inbattle, drawing in that conflict an excellent bow capable of bearing agreat strain shot innumerable winged arrows resembling snakes of virulentpoison, displaying his wonderful lightness of hand. Sanjaya said, “Having rested for a while, O king, both the Kurus and thePandavas, after the night had passed away, once more went out for battle. Dhritarashtra said, “Our army is possessed of many excellencies,consisting of diverse forces, its efficiency is great. Sanjaya said, “Thou hast, O king, in consequence of thy own fault, beenovertaken by this calamity. Sanjaya said, “Then king Duryodhana, regaining his senses, once morebegan to resist Bhima with showers of arrows. And once more those mightycar-warriors viz., thy sons, united together, began to fight valiantlywith Bhimasena.